Pedion: Journal #11 - Last chance to pre-order Pedion! Hello All! I tried to take a couple of days off amidst the Greek summer heat. But now it's time for some Pedion Terrain news! Only TWO DAYS LEFT to Pre-Order! I have to start with the more urgent business: in case you are already a backer and wanted to add some more things on your pledge right now, or you like Pedion Battlefields and missed the Kickstarter, there are only two days left on the pre-order extension through the eshop. 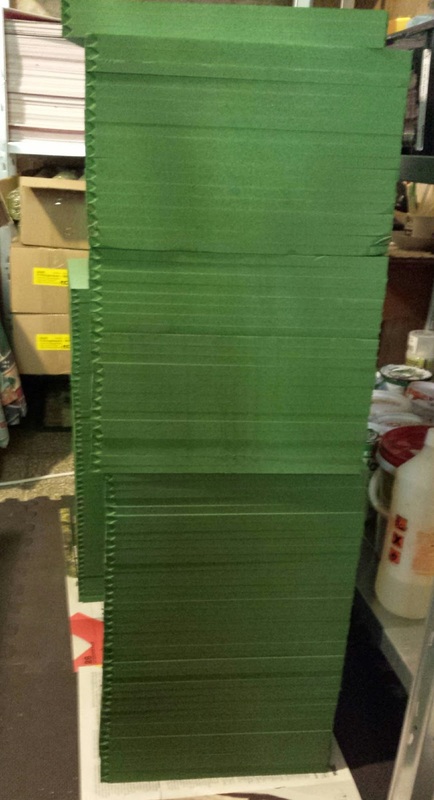 After the 21st of August 2015, I'll bring the pre-orders down and focus on producing the orders I have gathered so far (lots of backers have send their spreadsheets). Also, I have to prepare the final Pledge Management, which will probably go live on mid-September, and for which I was thinking of using the eshop interface instead of solution like Backerkit. ...and the Production is On! 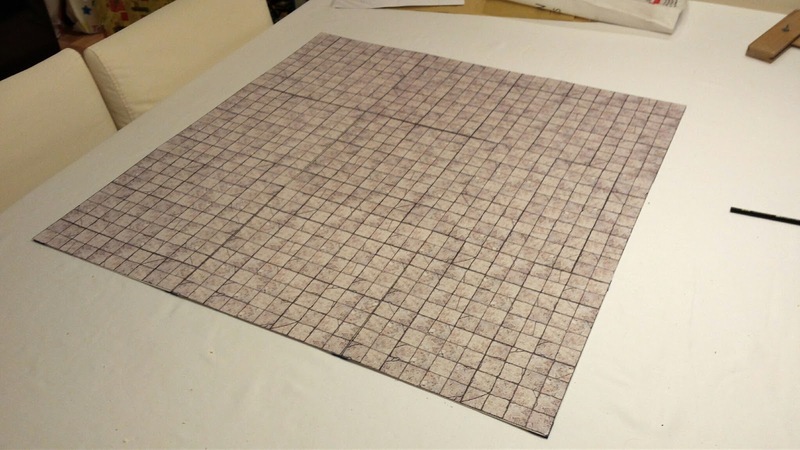 Most materials are already in house and we have started preparing, gluing and painting the tile bases in mass quantities. Lots of people asked about the narrow seam showing between the tiles, which is mostly created from the protruding 1mm magnets. So I improved the base tile design by creating depression into the tile sides to socket the magnets. The small alcoves are created en mass and then the whole column of 200 tiles is spray painted with the base side tile colour depending on the theme: deep green for Spring grass, sand yellow for desert, light grey for snow etc. The only hiccup so far is a small delay on magnet delivery. Magnets are the only part that we import, from the UK; but the latest batch was designated as unfit for air mail by the UK customs (?!) and is transferred by ground mail, so I expect them to arrive during this week. Though it does not regard the Modular Battlefields per se, this is Pedion related and we are very proud of it! 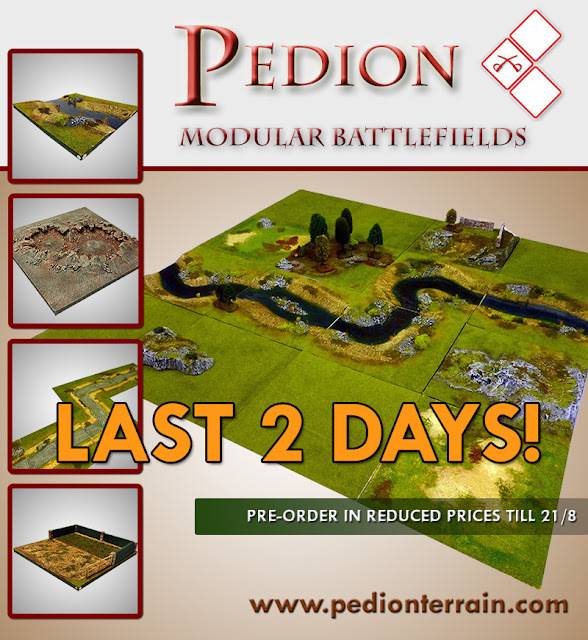 Pedion PrintTiles, our innovative modular gaming mat system, was used to form 4'x4' tables to exhibit the new HALO Fleet Battles game at Claymore 2015. The base 3x3 board was expanded with extra planet- and nebula-themed tiles (something you could not have done with traditional mats). On top you will see the beautiful 3D terrain pieces like Asteroids and Gas Clouds from Dave and Anne Yeomans, and of course the new Halo miniatures! Don't forget that you can already order the PrintTiles from our eshop! So, enjoy the rest of your summer, tell your friends to pre-order, and -of course- good gaming!